Beta Max TV | B-Movies to the Max! April 22, 2019: HOT STUFF FOR EARTH DAY!!! Check out the News tab‘s top story for more details! 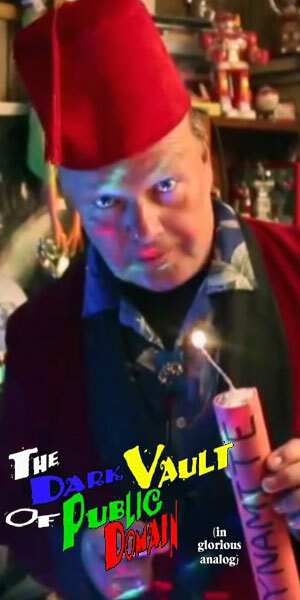 April 21, 2019: IT’S THE BETA MAX TV EASTER SPECIAL FOR YOUR B-MOVIE BASKET!!! Check out the News tab‘s top story for more details! April 17, 2019: SMALL ALIENS AND A BIG MONSTER ON DR. DRECK THIS WEEK!!! Check out the News tab‘s top story for more details! MOSTLY GREEN WITH A TOUCH OF BLUE AND BLOOD RED – COLORS YOU CAN GET INTO ON THE FRIDAY FUN-TIME FIVE!!! Springtime’s here, Easter’s around the corner, and Saturday is 4/20 – all events that bring to mind colorful things. So today Beta Max TV brings to your TV some colorful shows on this week’s FRIDAY FUN-TIME FIVE. The water is green and so is the monster on The Dark Vault Of Public Domain when Uncle Pete presents SWAMP OF THE LOST MONSTER (1957) Gastón Santos and his horse Rayo de Plata star in this horror western about people and bodies who disappear and the swamp dwelling monster that seems to be behind it all. The money is green but it’s rotten in The Midnight Movie presentation of TRAPPED (1949). There’s a counterfeit operation afoot and the treasury agents are setting up a sting operation to try to find the people running it – namely Lloyd Bridges! With this Saturday, 4/20, being a celebration of things green (no, not shamrocks and leprechauns – that other green “stuff”), Beta Max TV has harvested a film all about planting, growing, and using this common green herb. HEMP FOR VICTORY (1942) is a US government made product explaining the history and uses of the hemp plant while encouraging farmers to plant it during the temporary suspension of the hemp ban in World War ii. Just for some highlights, The Cinema Snob has a touch of blue in the adult movie spoof of the 2003 movie The Room called THE BED ROOM. And since blood red is one of our favorite colors at , we have Mondopiece Theatre’s review of the 1965 splatter film COLOR ME BLOOD RED, the third part of Herschell Gordon Lewis’ “Blood Trilogy” about a psychotic painter who murders people and uses their blood as just the right shade of red paint. It’s a mostly green FRIDAY FUN-TIME FIVE – with blue and red hints. 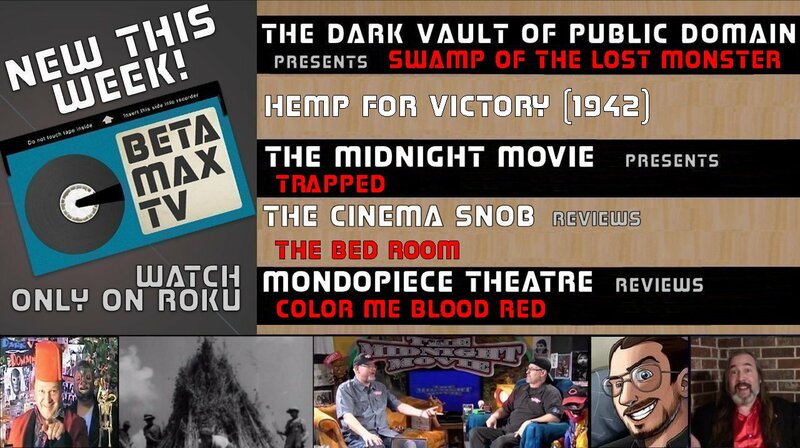 Smoke ’em if you got ’em – candy Beta Max TV cigarettes accepted – on your aromatic arena for B-movies…and more! Beta Max TV!! !